Ben Roethlisberger's attorney says he is "completely innocent of any crime." (CNN) -- Investigators have withdrawn a request seeking a DNA sample from NFL quarterback Ben Roethlisberger, his attorney said Wednesday. Ed Garland, Roethlisberger's Atlanta, Georgia-based attorney, said the request had been withdrawn. Roethlisberger, who has been the starting quarterback for the Pittsburgh Steelers for six seasons, is accused of sexually assaulting a 20-year-old woman at a rural Georgia nightspot this month. He has not been charged. Police talked to Roethlisberger, 28, and the woman at the scene immediately after the incident was reported about 2:30 a.m. March 5 at Capital City in Milledgeville, Georgia, said Deputy Police Chief Richard Malone. The woman "alleged that he is the perpetrator," Malone told reporters. He said that the woman was part of a group mingling with Roethlisberger's friends at the restaurant and that the groups had gone to other bars and restaurants over the course of the evening. The woman was treated and released at a local hospital. Police Chief Woodrow Blue declined comment on the DNA request Wednesday, saying, "We're still investigating and that is part of the investigation. ... We're still in the process of interviewing witnesses and re-interviewing some." Asked about interviewing Roethlisberger, Blue said, "It's still my hope that we will be able to. "Our emphasis is on a thorough, complete investigation," he said. "We do not want to rush anything. We want to do it right the first time." "The facts show that there was no criminal activity," Garland said in a statement earlier. "No sexual assault occurred. We are cooperating with the investigation. Ben is completely innocent of any crime. The truth of the events should cause this investigation to end without a criminal charge." Roethlisberger has guided the Steelers to two Super Bowl championships. 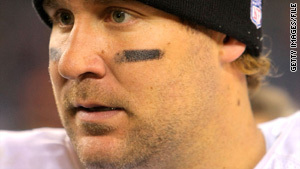 Last year, a civil complaint filed against Roethlisberger also alleged sexual assault. He has denied the allegation made by an executive casino host at Harrah's Lake Tahoe, saying, "Her false and vicious accusations are an attack on my family and on me; I would never, ever force myself on a woman." Roethlisberger and eight Harrah's employees are named in the suit, which seeks at least $390,000, plus unspecified punitive damages, from the defendants.